Eizo Nanao Corporation was founded as Hakui Electric Corporation in the quiet city of Hakui, Japan. EIZO began as an original equipment manufacturer (OEM) of black and white televisions. The company changed its name to Nanao Corporation. EIZO entered the gaming market by beginning the manufacture and sale of tabletop video arcade machines. An EIZO table top was used with one of the 20th century's most recognizable arcade games: Space Invaders. EIZO acquired Irem Corporation, a maker and purveyor of software for home and industrial use. Integrating its hardware and software expertise would become the core of EIZO's business model in the years to come and remains that way today. As the company continued to grow, a new factory was built on a parcel of land adjacent to several acres of rice fields in Hakusan, Japan that later became the company's international headquarters. Click image to enlarge and compare with aerial view in 2007. Capitalizing on a global PC revolution, EIZO decided to expand its business overseas by founding Hitec Associates Ltd. (later renamed Eizo Corporation) in Kanazawa, Japan as a sales subsidiary for the European market. After 17 years as an OEM manufacturer, the company began a new chapter in its history by selling its display monitors under its own name – or two names as it turned out. For the North American market, the company founded Nanao USA Corporation in California (now operating as EIZO Inc.) and sold its monitors under the NANAO brand name. In Europe, the company took a different route and chose the brand name "EIZO," which is the Japanese word for "image." The first EIZO/NANAO monitors came in 12- and 14-inch sizes and offered a "compact design and light weight." Some even boasted a "720 dots x 400 lines super high resolution." To accommodate continuing growth, EIZO built new global headquarters and a research and development facility in Hakusan, Japan, next to a plant it opened in 1981. The following year, EIZO added a second plant. After seeing its products appear on the shelves of Tokyo electronics stores as "reverse imports," the company began the sale of CRT display monitors for personal computers in its home market of Japan under the NANAO brand name. Swedish subsidiary Eizo Sweden AB founded (now operating as EIZO Nordic AB). EIZO Nordic AB participated in the pioneering TCO forums, helping to establish guidelines for monitors concerning electric and magnetic field emissions, energy efficiency, and electrical safety. EIZO produced its first LCD monitor for PCs, the FA-1020, years before LCDs became commonly available. This 10.4" model came in desktop and swing arm versions. Acquired ISO 9002 Quality Management System Certification. The company discontinued using the NANAO brand name in North America and Japan and adopted EIZO as its brand name worldwide. With this global brand name came a new EIZO logo and distinctive new CRT monitor cabinet design which became a hit with business and home users alike. Acquired ISO 9001 Quality Management System Certification. Advances in LCD technology combined with a demand for more space-efficient monitors made it feasible to begin mass production of LCD monitors for PCs. EIZO brought one of the first LCD products to market with the 13.8-inch FlexScan L23. Acquired ISO 14001 Environmental Management System Certification, a management system EIZO has updated three times since then. Nanao Corporation and Eizo Corporation merged and assumed the company's present name of Eizo Nanao Corporation. When LCD monitors first became widely available in the late 1990's, their bezel widths rivaled those of CRT monitors. EIZO changed all that with the release of the FlexScan L675, the world's first thin-bezel desktop LCD monitor. With a bezel width of what at the time was a revolutionary18.5 mm, the L675 was an instant hit in trading rooms and back offices. With the rapid digitization of images in the medical field, EIZO entered the medical imaging market with its RadiForce line of monitors. To commemorate five years of manufacturing LCD monitors, EIZO released "Placeo", a 17-inch model with an aluminum cabinet. Only 3,000 pieces of this limited edition monitor were manufactured. The company established "EIZO Eco Products" as an eco logo with the purpose of ensuring its products meet an internal set of criteria for environmental consciousness. EIZO has since updated EIZO Eco Products three times. Although the migration to LCD technology in the corporate world was well underway, professionals in color-critical fields such as pre-press and photography were still clinging to their aging CRTs. EIZO made it safe for them to finally make the switch when it introduced its ColorEdge series – the world's first line of LCD monitors specifically targeted at graphics professionals. Building on the initial success of its ColorEdge monitors, EIZO introduced the ColorEdge CG220, the world's first LCD monitor capable of reproducing the Adobe RGB color space. EIZO returned to its roots as a TV manufacturer with the introduction of the FORIS line of LCD TVs in Japan. EIZO acquired the Eizo Business Unit of EXCOM AG, its sales distributor in Switzerland, and established the fully owned subsidiary Eizo Nanao AG. EIZO became the first stand-alone monitor manufacturer to receive ISO 13485 certification for the quality management system for its medical display devices. 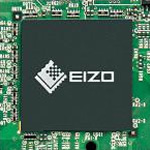 EIZO acquired graphics board developer and manufacturer, Tech Source, Inc. of Florida, USA. With this acquisition, EIZO entered the air traffic control, military and defense, and command and control markets. Later this year, EIZO acquired the medical monitor business of Germany's Siemens A&D and established a new subsidiary, EIZO GmbH, in Karlsruhe, Germany. Through this acquisition, EIZO expanded its presence in the medical market, strengthened its R&D expertise, and now had production capability in Germany. The company opened a new 2.5 billion yen, six floor research and development center within its global headquarters in Hakusan, Japan. EIZO entered into a definitive agreement with eg-electronic GmbH of Wolfratshausen, Germany to acquire the latter's business units for industrial monitors, air traffic control monitors, and monitor control boards. The acquisition was finalized in February 2009 and a new subsidiary, EIZO Technologies GmbH, in Wolfratshausen, Germany, officially began operations. Previously only available in Japan, EIZO expanded its FORIS line of TVs to include PC monitors for home entertainment and released FORIS monitors worldwide. Anticipating rapid growth in China for medical services and medical devices, EIZO established a wholly-owned subsidiary in China, EIZO Display Technologies (Suzhou) Co. Ltd., to manufacture medical monitors for the Chinese market. EIZO established two wholly-owned subsidiaries, Europe GmbH (Germany) and EIZO Limited (United Kingdom), to expand its sales and marketing activities in Europe. Changed company name from Eizo Nanao Corporation to EIZO Corporation. EIZO acquired Imation’s medical system integration business in Japan through a wholly-owned company named EIZO Medical Solutions Inc. .
EIZO acquired endoscopy monitor business from Panasonic Healthcare Co., Ltd. of Japan. Acquisition of Carina System Co., Ltd.
EIZO acquired Carina System Co., Ltd., a developer of system solutions for operating rooms.